THIS EVENT IS COMPLETELY SOLD OUT. THERE WILL BE NO TICKETS AVAILABLE ON THE DOOR. A celebration of the life of Marcus Intalex. We celebrate the life and work of Marcus Intalex as Soul:ution returns for a Band on the Wall special. 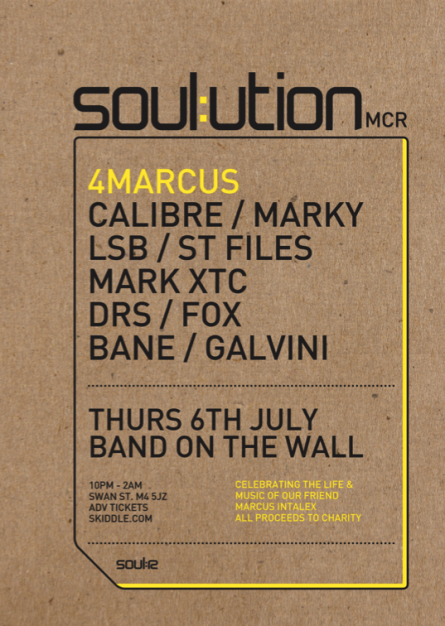 Resident MC DRS hosts with Soul:ution regular Calibre, ST Files and a lineup of friends playing to honour a true DnB pioneer. Marcus began DJing in the early 1990’s and was instrumental in the creation of a distinct style of Drum n Bass through his productions and clubnights. He became widely known in the city due to Da Intalex show on Kiss 102 with Mark XTC which ran from 1993 until 2000. During this time he promoted and was resident at the Guidance nights at Sankey’s Soap before starting Soul:ution in 2002 – after a couple of events at Joshua Brooks this moved to Band on the Wall where it developed and attained a loyal following and acclaim. The venue and event was praised in City Life and Marcus was awarded DJ of the year in 2004. From 2002 onwards Band on the Wall hosted over 70 Soul:ution events, both before and after the renovation of the venue. In the intervening years the Roadhouse played host. Marcus released many incredible records through his Soul:r and Revolve:r imprints, as well as on other labels such as Metalheadz, Exit and 31, often working in collaboration with artists including Calibre and ST Files. He had a broad musical taste and visited Band on the Wall on occasion as a customer to watch live music performances. He also had a great love of Techno and Golf – these interests combined in the moniker chosen for the techno productions, Trevino, the label for that output – Birdie. Please join us to pay tribute to our friend. All proceeds from the event will go to good causes close to Marcus’ and his family’s heart.